The 7 Minute Life is a company specializing in time management and productivity. 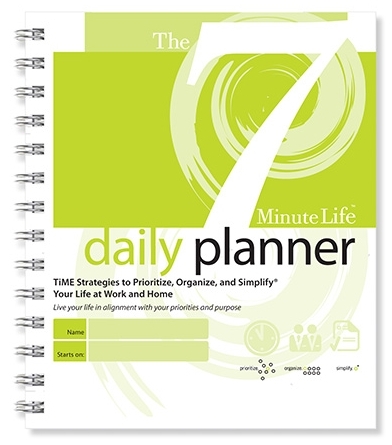 They produce The 7 Minute Life Daily Planner and this post is my review of this product. When it comes to planning and organizing, I am the first in line. There’s a running joke between me and my husband about my passion for planners. You do not want to know how many planners I have tried and used over the years. The 7 Minute Life Daily Planner is different from something you would pick up at Walmart or a bookstore. The regular features of a planner are there, of course, but then there is the front matter of the planner – that’s where you take the time to actually sit down, relax, and understand yourself and your goals. First things first… Why this title? What’s with the seven minutes? Well, research shows that the average adult has an attention span of about seven minutes. Isn’t that scary? Regardless, the idea is to take seven minutes every day and plan your day, especially certain projects that absolutely must be done.